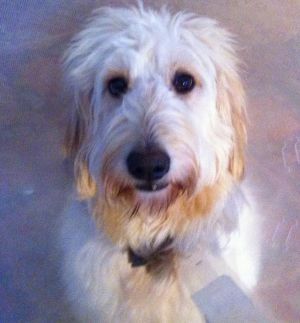 Lexi is a gorgeous, 2 year old Goldendoodle. She is spayed and utd on shots. She sheds a little and would not be considered hypoallergenic. Lexi is a playful and happy girl. She is all pup and likes to run, jump and play. Lexi is housebroken and knows basic commands but could use some help with using up her energy. The perfect adopter will have a FULLY FENCED YARD, maybe be a runner or like to WALK, older children (over 10), as she could knock down little ones, and be willing to teach her and love her Forever. Lexi gets along with other dogs but will chase cats. She is affectionate and loves to snuggle. If she sounds like she will fit into your family, PLEASE FILL OUT AN APPLICATION (Link Below).